Property Owners: List your Nord-Pas-de-Calais property on the premier site specialising in French holiday lets. More Info. View villas and gites in Nord-Pas-de-Calais. The key to a perfect holiday is picking the correct accommodation. Nord-Pas-de-Calais gites, like all French gites, are guaranteed to give you a holiday where you can relax and run to your own schedule. At the same time, you’ll feel much closer to the French people than you would in a somewhere like a hotel. The same experience can be had if you stay in a Nord-Pas-de-Calais villa, as the villas are all comfortable, cosy and welcoming. 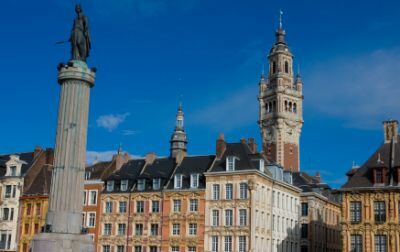 Nord-Pas-de-Calais may not be the first region that comes to mind as a holiday destination, yet it has much to offer. Scattered throughout the region are more than sixty medieval Renaissance or baroque belfries, all of them carrying the badge that marks them out as a collective UNESCO world heritage site. Also spread out are the St. Omer fens, an area which incorporates both a nature reserve and a wetland area with a wealth of bird life. To the north is Dunkerque, famous for obvious reasons, but today housing a marina and art gallery. Nearby is the old Roman settlement of Cassel, perched on top of Mont Cassel, about thirty kilometres inland. This attractive town affords visitors extensive views over the surrounding countryside as well as a museum of local art, history and folklore. Every Easter, it stages a carnival. Avesnes-sur-Helpe has wide-open country parks and leisure facilities, one of the most popular being Val Joly. The area around Avesnes used to be home to many craft-based industries, all now sadly gone, but the Ecomusée, taking in eight different sites, preserves the memory of each one through the recreation of the skills and way of life of those who went before. There are also two working watermills. A fascinating and thoroughly absorbing day out for one and all. Waterzooi, originally from Belgium, is a very popular stew in the region. Although it’s usually made with fish, such as bass, eel, carp or pike, chicken variations are not unknown. However, they tend to be called Kippenwaterzooi. A real culinary classic, again with Belgian origins, is Potjevleesch, often just called Potch. It’s a loaf-shaped mixture of cold rabbit, chicken and veal, covered in a rich jelly. It’s usually served cold with chips, salad and gherkins. Nord-Pas-de-Calais produces some nice cheeses, the most famous being Maroilles, a soft, creamy cheese. Although the colour of the rind may be brown, red or yellow, the cheese inside is always consistently the same. If you have a sweet tooth, you may like to sample the region’s Les Bêtises de Cambrai, a confectionery with a refreshing, minty taste, made from only natural products. The region may not be the first to come to mind when thinking about wine, but it does produce some that are worth tasting. The same applies to beer, and many of the latter have won awards for both their taste and quality. Four worth mentioning are Grain d’Orge, a beer with a powerful, smoky aroma, Ch’ti, a full-flavoured beer, Septante-5, orange in appearance with a caramel flavour, and Saint-Poloise, a light, golden beer that’s gentle on the palate.